You can receive a one-time savings of 15% off orders of US$375 or more containing full or upgrade versions of any Adobe software. 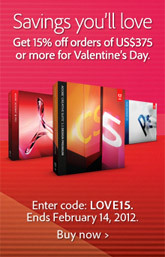 In order to redeem the 15% discount, you must have the special promotion code LOVE15 applied in your Adobe shopping cart. And good news for students: the offer is valid for both commercial and education customers – meaning you can get an additional 15% off the already-discounted academic pricing. Outside of that exceptional case, the coupon may not be used in conjunction with any other offers – meaning you can’t combine it either with the current half-price on Lightroom offer, or with the 20% discount on CS5.5 upgrades offer (both of which are better anyway, and worldwide). For this 15% off promotion, orders must be placed by Valentine’s Day, February 14th, 2012, at 11:59pm PT. This offer is available only to customers with shipping addresses in the USA, Mexico, and Canada (excluding Quebec, not sure why), with one discount per customer. It’s not valid for Adobe Volume purchases, though you can still buy multiple copies and it will apply to the first two products that bring the total to $375 or more. These type of unrestricted coupons don’t come along very often for Adobe, so if there’s a purchase you’ve been thinking of, now could be a good time… And as always, you can download and try out any product you like for free, and then convert the trial to a permanent version using this offer if you so decide. For our international readers, we regret that you aren’t able to take advantage of this discount, but note that other current specials like 50% off Adobe Lightroom and 20% off CS5.5 upgrades are both available to you worldwide now. I want to ask Adobe, why is that? Why make double on others? Hi Adam, thanks for your comments, and others have asked the same question… Here is a detailed explanation that will hopefully help at least a little in explaining the price differences of Adobe products in many countries around the world. Although the 15%-off promotion is for North America only as you note, Adobe is currently running some other significant deals for customers internationally – see the bottom of the story above.